You won’t believe how wonderful these scissors feel in your hand! Recognized as the finest name in the business, Gingher products are guaranteed against defects in workmanship and materials. 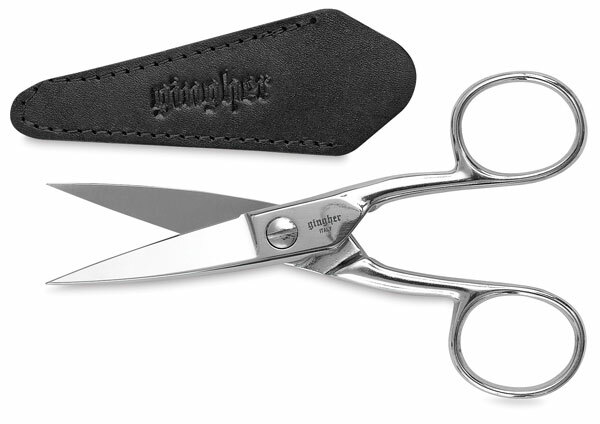 Dressmaker's Shears — A durable spring action opens these shears after each cut so you're always ready for the next cut. The precision-ground knife edges cut multiple layers of fabric with ease all the way to the points, making them perfect for cutting patterns and trimming seams. The bent handle offers a comfortable working angle, and allows the shears to lie flush with the fabric and cutting surface. A safety latch locks the blades together when the shears are not in use. They feature a durable, double-plated chrome over nickel finish. Sewing Scissors — The slightly longer knife edge on these sewing scissors cuts multiple layers of fabric, making them ideal for quilting, sewing, and crafts. They feature a durable, double-plated chrome over nickel finish, and come in a leather sheath.